The Tempurpedic® Bed advertising cost can amount to over 100 million dollars annually. This cost is tacked onto the cost of their mattresses. So, if you purchase a Tempurpedic® Bed, you will be paying hundreds of dollars just for the advertising cost. That does nothing for you! The average cost of a king Tempurpedic® Bed (mattress, foundation, bed frame) is $4433. That's about double the price of our Pure Health® Bed, which has far more benefits. 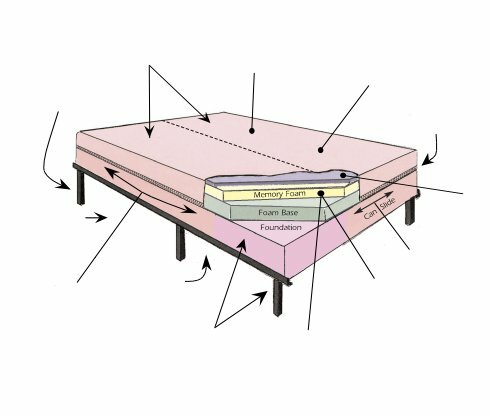 Memory foam is the main feature of the Tempurpedic® Mattress, but memory foam is not unique. It is available in many mattresses that cost hundreds less than the Tempurpedic® Mattress. The Tempurpedic® Mattress is lacking a critical feature. It has no firmness adjustment feature, which allows each sleeper to independently adjust the mattress firmness for their specific size, shape, weight or health problem (injury). The Tempurpedic® Mattress top cover has no filling to separate the sleeper from the foam. This close contact with the foam can cause discomfort and sweating due to body heat build-up. The Tempurpedic® Mattress top cover is attached to the bottom cover by a zipper. Most everyone knows what can happen when starting or getting material caught in a zipper - it can be easily ruined. The Tempurpedic® bed frame has very small support legs that contact the floor. They can each apply as much as 100 pounds of weight per square inch on the floor (depending on the weight of sleepers). The Tempurpedic® bed frame and foundation (cost $490), have only one purpose. They hold the mattress off the floor. The Tempurpedic® bed frame permits dust to accumulate under the bed. Dust is difficult to remove, and can affect sleepers who have dust allergies. Most bedrooms are short on drawer storage and floor space. The Tempurpedic® bed frame and foundation use space that can provide storage. Our Pure Health® Bed has far more benefits and none of the Tempurpedic Bed® problems. It can also save more money than it costs!